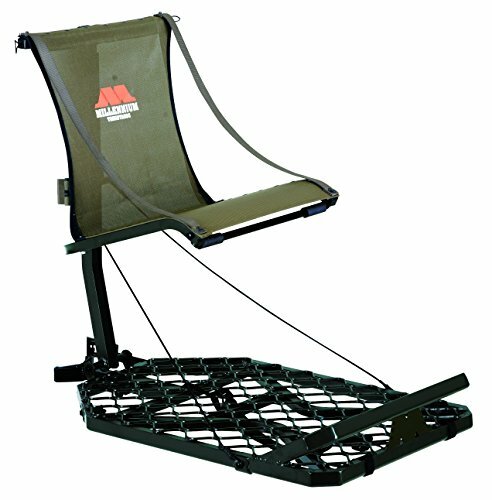 Designed with everything you could want in a lightweight, portable lock-on stand, the M150 Monster is ideal for the hunter on the move. Similar to the M100, the M150 Monster features V-Brace Technology to minimize weight without compromising strength and stability. But, unlike it's predecessor, the M150 Monster is designed with an adjustable seat height of 17-Inch to 20-Inch and 15 degrees of lean for tree-angle adjustment. The Interlock Leveling System allows for the seat and platform to be leveled, making the tree stand more comfortable and reliable when setting up in tricky areas or against leaning tree. Another feature of the M150 Monster that makes it stand out among the rest is the CamLock Receiver system, which allows for multiple stand locations to be preset, making changing locations quick and simple. Simply secure the CamLock Receiver to the tree, hoist up the M150 Monster and then slide its aluminum stabilizing post into the receiver. You can install additional receivers in other locations so you'll always have several locations to hunt. With the CamLock Receiver system and the Silent Hunt Design of the tree stand, you can rely on it being super quiet and efficient throughout the hunt. Specifications: Platform - 37-Inch wide x 24-Inch deep; Seat Height - 17-Inch - 20-Inch; Weight - 19.5 lbs. ; Capacity - 300 lbs. Model M-150.